At some point or another, you and I will have moments when we aren't in cars (I know, it's terrifying.). But if you happen to not be in a car in a place called Los Angeles, expect to have a less-than-swell time, as police are cracking down on pedestrians like never before. Well, not just pedestrians, but a specific kind of pedestrian: the jaywalker. In recent weeks the department has issued dozens of jaywalking citations to pedestrians, and they aren't cheap. Still, the enforcement has struck many of the pedestrians — the new kids on the block — as more than a little one-sided and strikingly strict. When Adam Bialik, a bartender, stepped off the curb on his way to work at the Ritz-Carlton a few blinks after the crossing signal began its red "Don't Walk" countdown, he was met by a waiting police officer on the other side of the street and issued a ticket for $197. "I didn't even know that was against the law," he said. "I was like, 'You are the L.A.P.D., and this is what you are doing right now?' "
"Honestly, I cussed them out for about five minutes," he said. "I told them what a stupid waste of time this was, and wasn't it great that they had two police officers standing there when there are obviously more important issues out there." The Times depicts this as a clash between pedestrians and Los Angeles' long-entrenched "car culture," but that's a misnomer. The traffic-choked city is a victim of commuter culture, not car culture; the two are not the same thing. Being stuck in traffic for hours on end in your boring, awful commuter car is not car culture. There are an increasing number of people using bicycles, taking advantage of an expanding network of bike lanes. Los Angeles is in the midst of a major expansion of its subway and bus system. 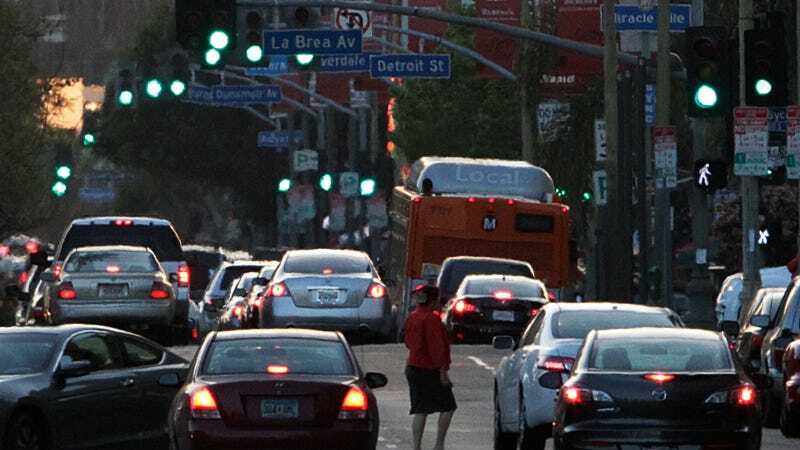 Much of the urban planning in recent years, particularly downtown and in Hollywood, is intended to encourage people to give up their cars in favor of public transit, walking or biking. And that's a good thing, because commuter culture doesn't do anyone any favors, and it sure as hell isn't fun to drive a car in. The police actions against jaywalking is being protested by downtown business groups, who fear it may scare off tourists. The timing of this initiative — which comes at a time when more and more people are abandoning cars — strikes me as odd. Is this really about safety, or is it about revenue collection at a time when the city has more people walking than ever before? You'd have to ask the LAPD that, but make sure you aren't in the street when you do.